The brand for every teenage girl who wants to have fun and look good at the same time is here. The Brand New Range of Matte Lipsticks from the Elle 18 range is here. Matte is in trend and we have the range to keep you trending. Apply a bold stroke of Elle 18 Color Pops Matte Lip Color to get the perfect look. Elle 18 Color Pops Matte Lip Color range of lipsticks gives high color payoff from a single stroke because of its new formulation. It last long because of the bold Matte texture. It has vibrant and fun shades to choose from for your every mood and every look. 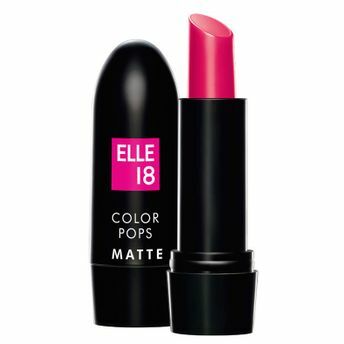 So go through the wide range of Elle 18 Color Pops Matte Lip Color and pick the color of your pout! Buy Now! Single color lipstick (without the moisturizing core). Explore the entire range of Lipstick available on Nykaa. Shop more Elle 18 products here.You can browse through the complete world of Elle 18 Lipstick .Alternatively, you can also find many more products from the Elle 18 Color Pops Matte Lip Color range.